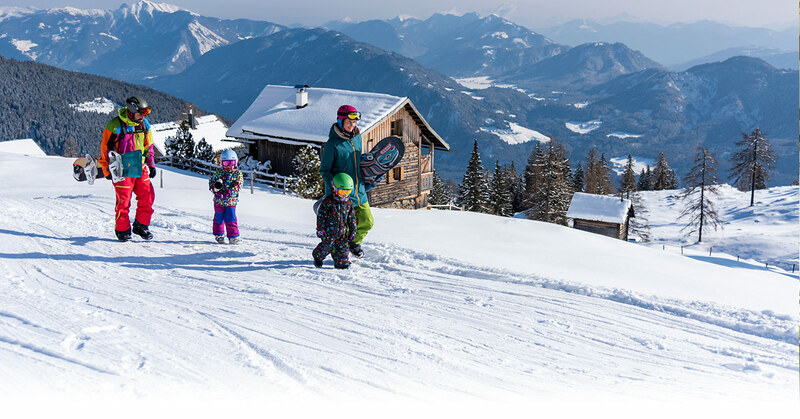 Prices per day per person in euro with gourmet full board and Glocknerhof inclusive facilities. 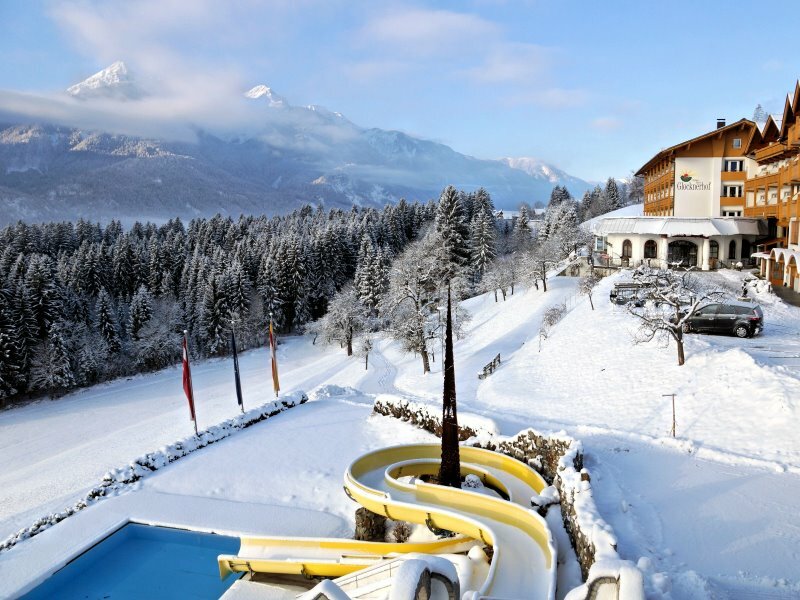 The use of numerous sports facilities, Hotel facilities, services, WIFI and all taxes are included in the price. New 2019: All rooms and suites in the adjoining building were completely renovated. Corner for coffee and teas is included all day long. You can take a hot drink from morning until evening. WIFI is available for free in all rooms and in the whole hotel. Here you find our prices for summer. 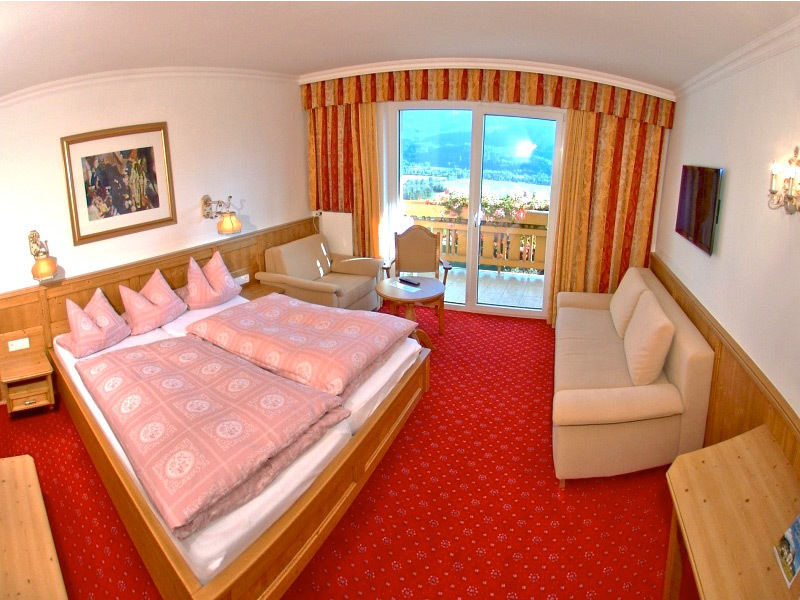 In all double rooms (Categories Komfort, Superiour and Deluxe). Book online now and make sure of getting this bonus! Please select rate type "Special weeks" on the booking page. 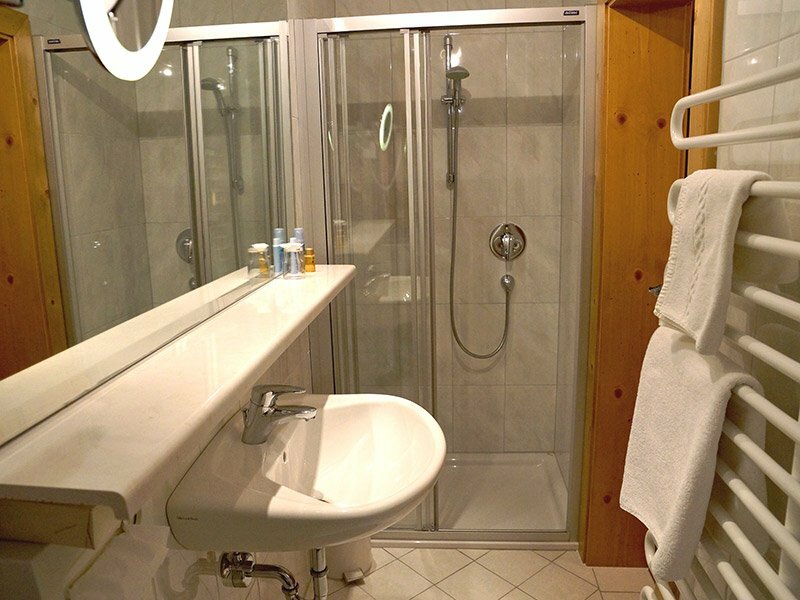 30 m², double room in the main building with bath/shower, toilet, phone, safe, Internet via WIFI and cable, 40'' LED TV, hairdryer, balcony, cosmetic mirror, for two persons, two additional beds possible. All double Deluxe are located in the main building and are our main category. The rooms have a south- or west-facing balcony, bath or shower, WC, hairdryer, cosmetic mirror, LED TV with 40'' screen, desk, safe, phone, dimmable bedside lights, insect screen and Internet access via WIFI or cable. Some of the rooms also have a couch. 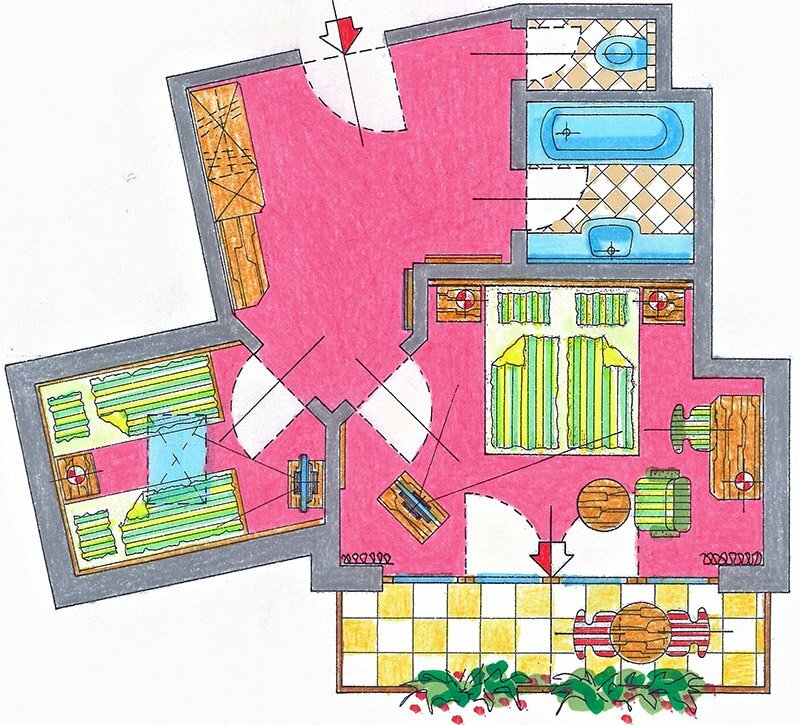 The ideal occupancy is two persons, but rooms with a pull-out couch also offer space for families of up to four persons. 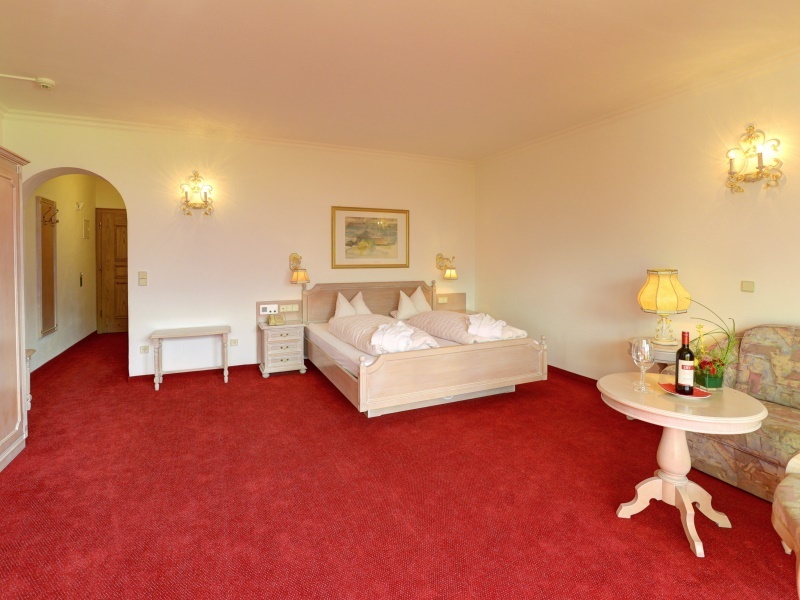 12 m², the small Deluxe single rooms are in the main building on the north side and do not have a balcony. They have a shower, WC, 40'' LED TV, phone, hairdryer and cosmetic mirror. Internet via WIFI or cable. No single room supplement! 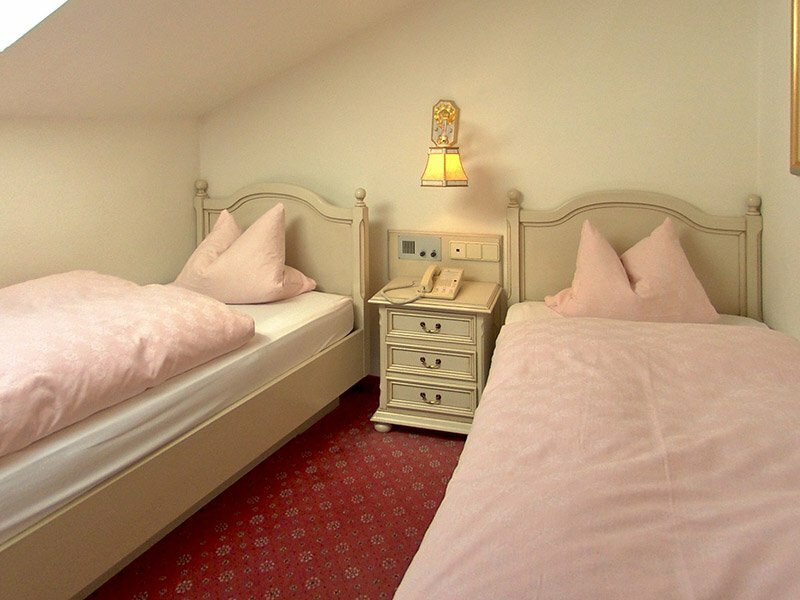 The A “Deluxe” single rooms are in the main building on the north side and can also be booked in addition to a double room as a child’s room. The rooms have a shower, WC, hairdryer, cosmetic mirror, LED TV with 40'' screen, desk, safe, phone, dimmable bedside lights and Internet access via WIFI or cable. They do not have a balcony. There is no single room supplement for A “Deluxe” single rooms; this is only charged when an A “Deluxe” double room is booked as a single room. 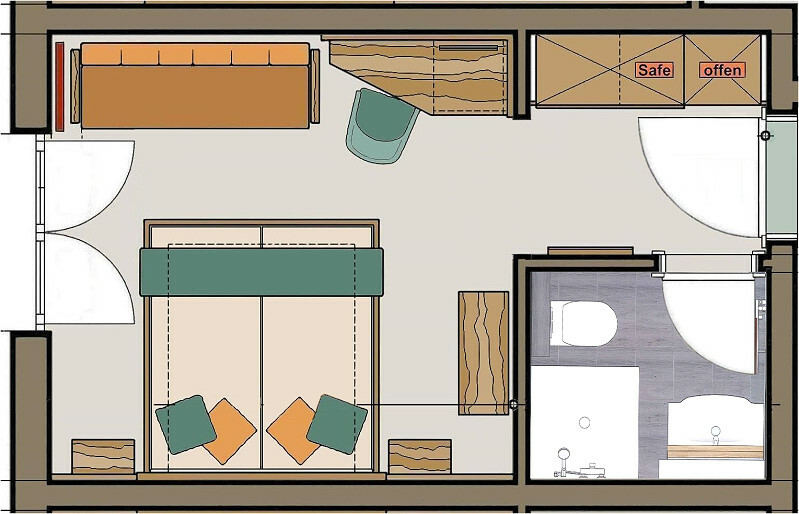 45 m² studio in the main building with bathroom and separate WC, radio, WIFI, south-facing balcony, hairdryer, phone, radio, 40'' LED TV, safe, large bedroom with living area, couch, for two persons, two additional beds possible on the couch. 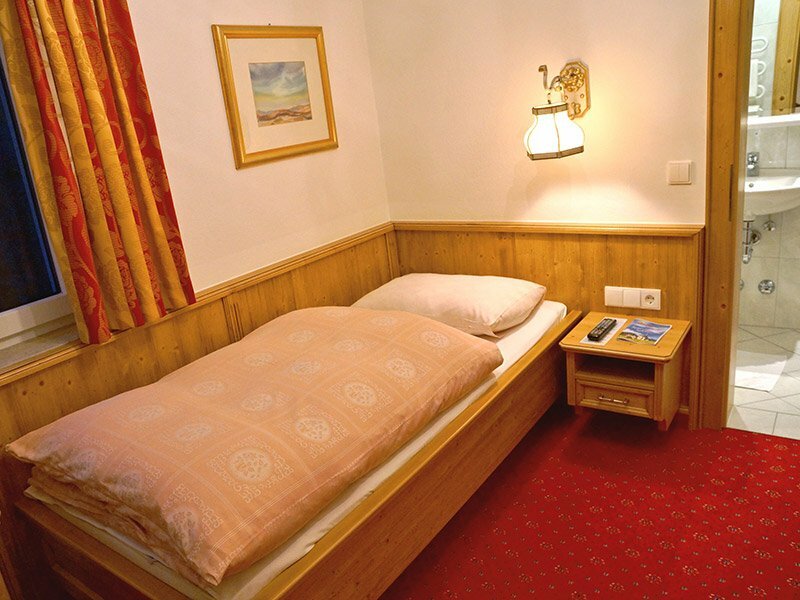 The “Reißkofel” studios are situated in the main building and are a perfect choice for everyone who wants a little more space. 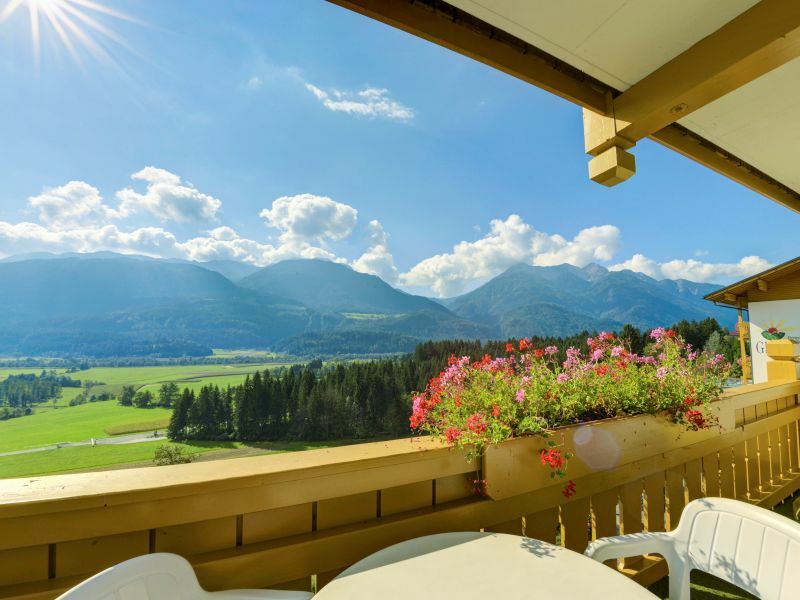 A large south-facing balcony with a fabulous view of the mountain panorama of the Upper Drau Valley is an inviting place to spend time. The room itself consists of a large bedroom with living area, an LED TV with 40'' screen, couch, radio and phone, a bathroom with bath, cosmetic mirror and hairdryer and a separate toilet. The room can be darkened with the blind. WIFI Internet access is available. This studio offers two persons a great deal of freedom within their own four walls. Thanks to the pull-out couch there is also sufficient space for families of four persons. 40 m², in the main building with shower and WC, large south-facing balcony, cosmetic mirror, hairdryer, safe, phone, Internet via WIFI and cable, 2x 40'' LED TVs, couch. 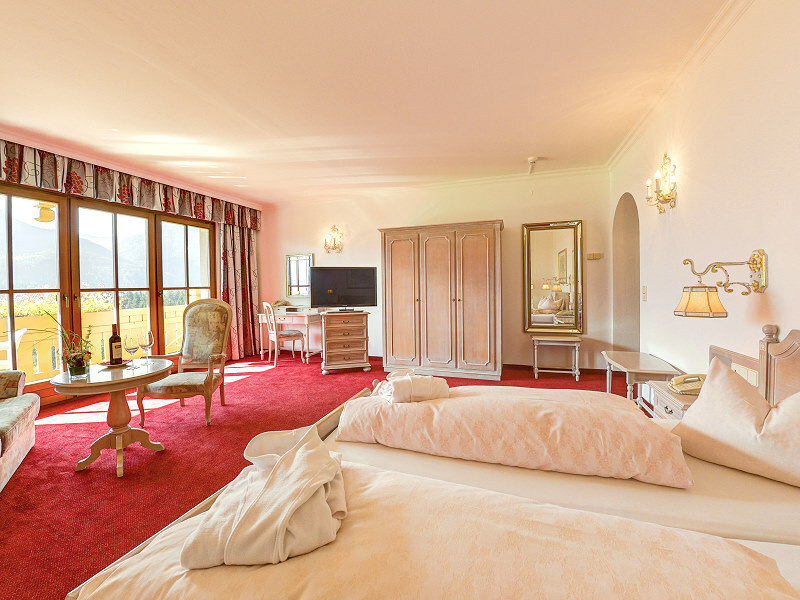 The Type B1 “Spitzkofel” panorama suite is in the main building and offers a south-facing balcony extending the full length of the room. The room consists of a bedroom, a living room. 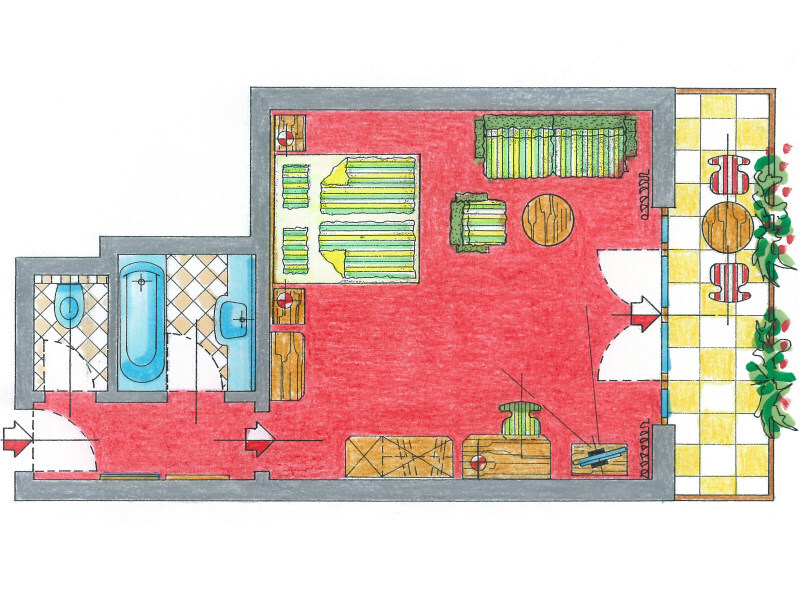 a small vestibule and a bathroom with shower, WC, cosmetic mirror and hairdryer. It also has 2x 40'' LED TVs, phone, safe, insect screen and plenty of storage space. Internet access is available via WIFI or cable. The room contains two normal beds. Thanks to the pull-out couch families will also be comfortable here. 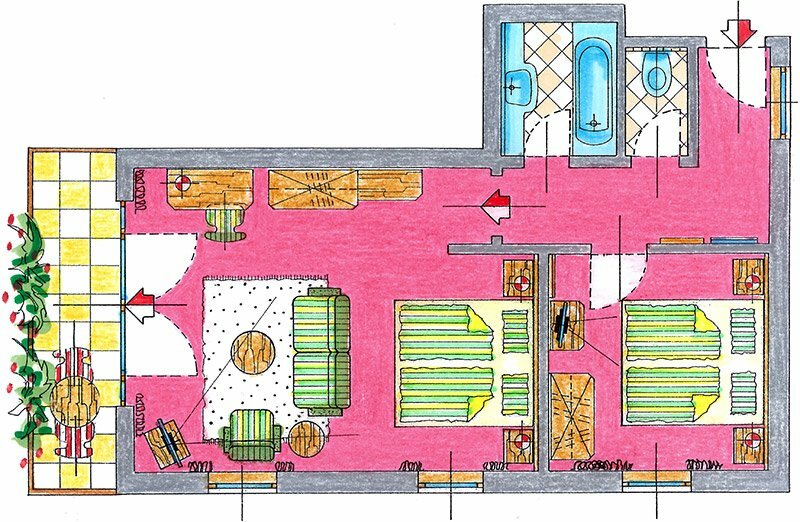 40 - 64 m², in the main building, separate bathroom and WC, south-facing balcony, hairdryer, WIFI, safe, two bedrooms, a living area, two 40'' LED TVs, radio, phone, for 3-5 persons, additional beds possible. 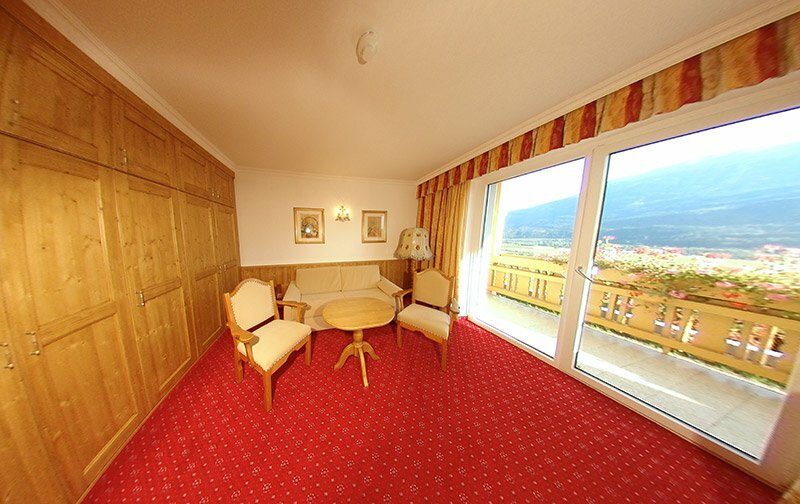 The Type F “Kreuzeck” panorama suites are in the main building. 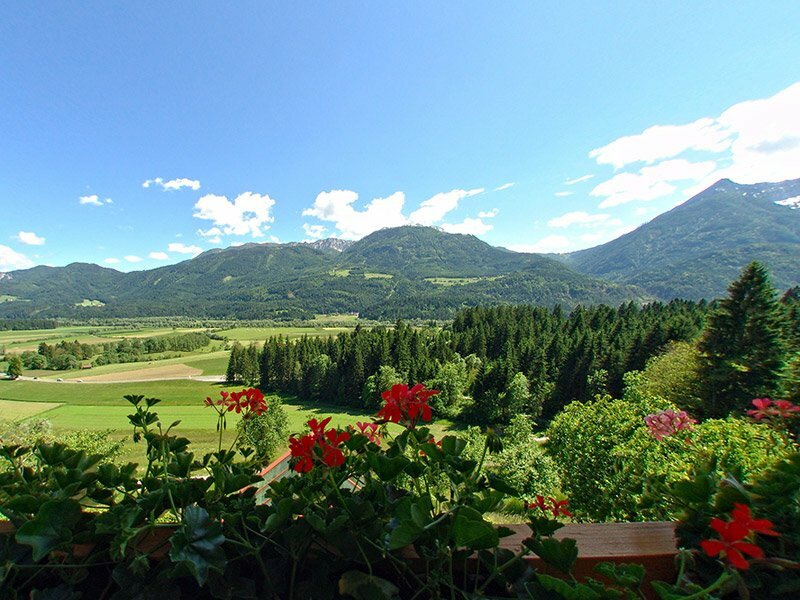 The south-facing balcony offers a great view of the surrounding mountain landscape. 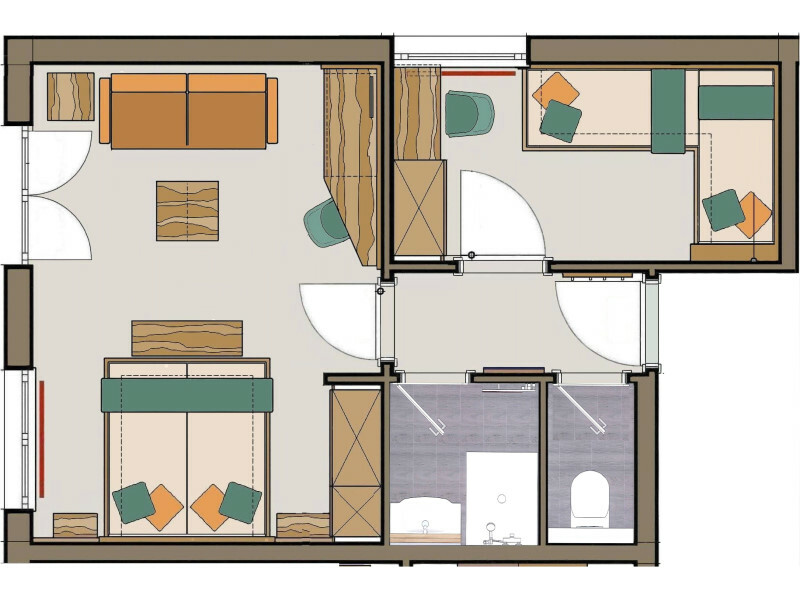 These suites are differentiated from most of the other categories by their two separate bedrooms (one larger bedroom with living area and one smaller bedroom). As a special highlight the room has 2x 40'' LED TVs. 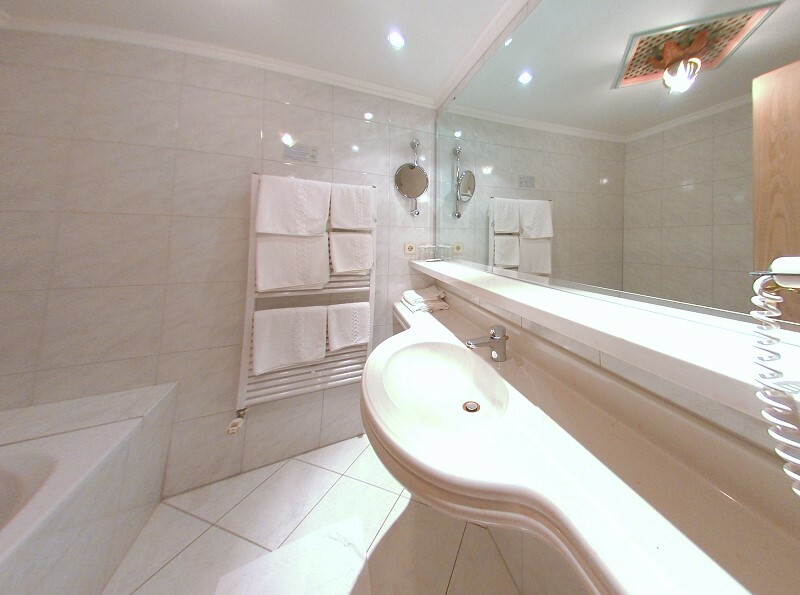 The room also includes a bathroom with bath, hairdryer and cosmetic mirror, a separate WC, radio and phone. WIFI Internet access is available. 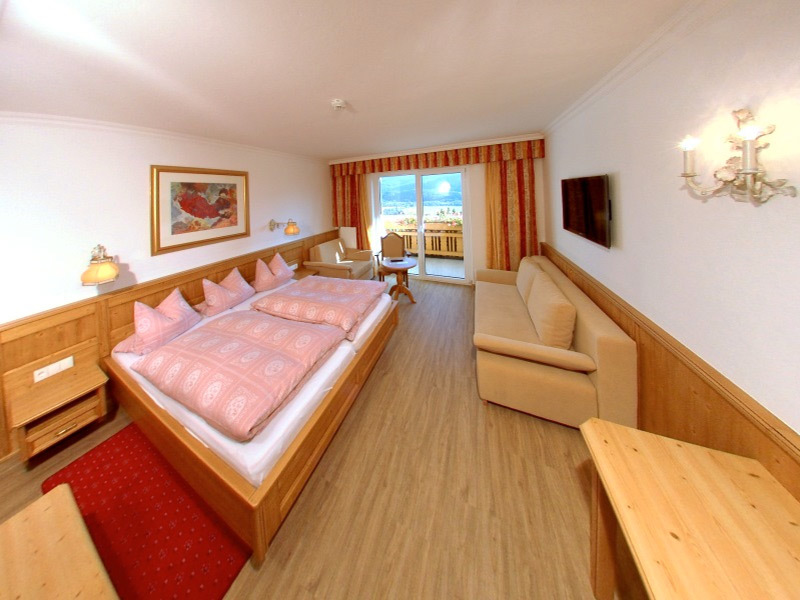 There are 3 to 4 normal beds in the room in total. 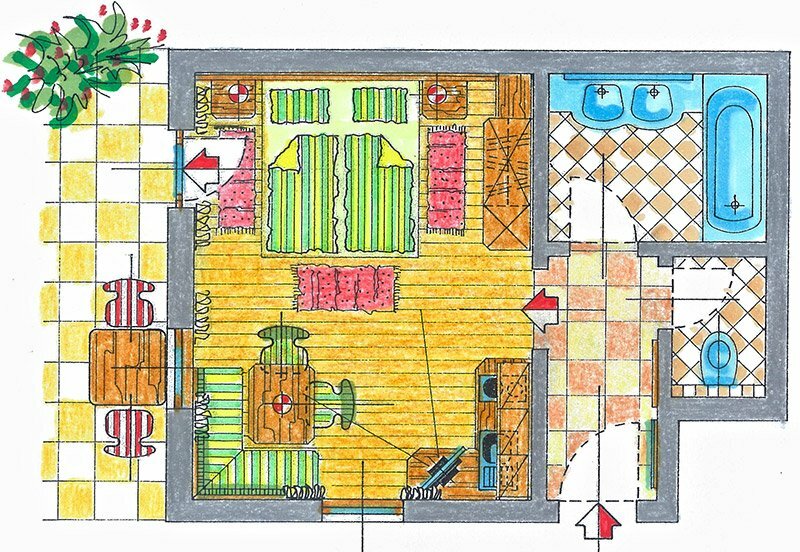 Larger families will also find sufficient space due to the size of the room and the pull-out couch. 25 m², new renovated double room in the adjoining building with shower, WC, phone, safe, cosmetic mirror, 40'' LED TV, hairdryer, refrigerator, Internet access via WIFI and cable, balcony, for two persons, two additional beds possible. 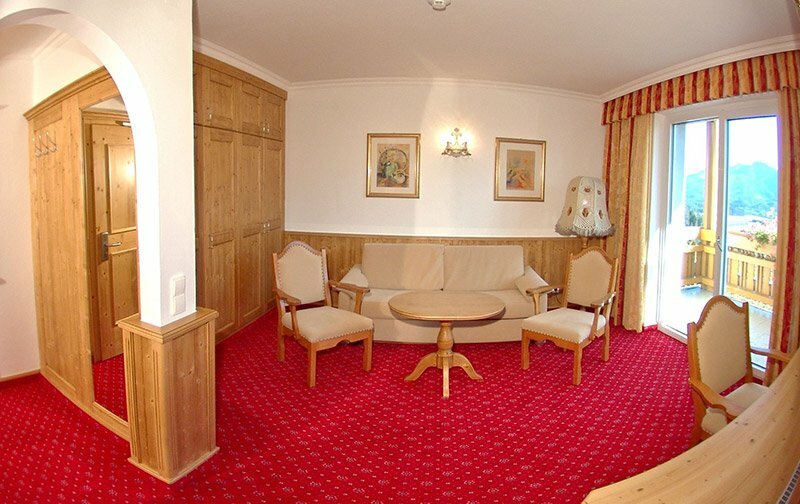 NEW for Winter 2019: Double room Superior in adjoining building were renovated completely. 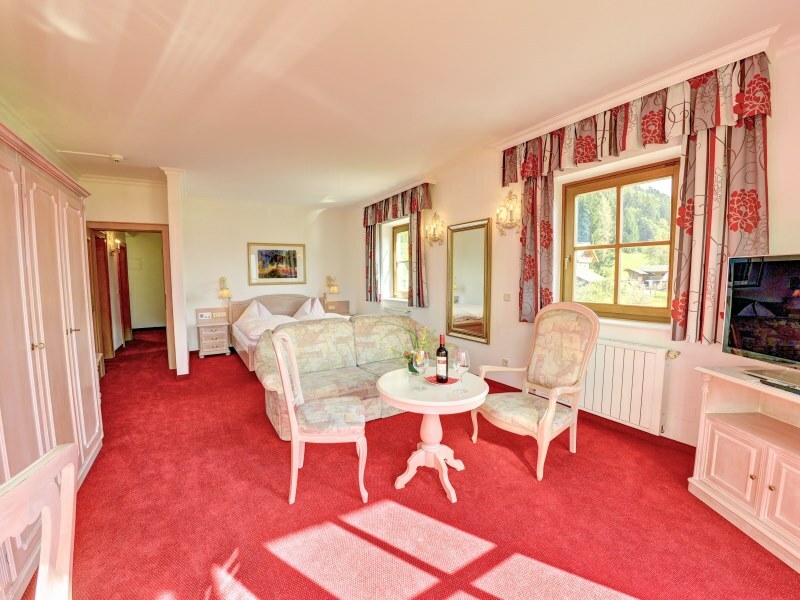 All Double Superior rooms were renovated completely in Autumn 2018. They have a balcony, dimmable lamps, black-out curtains, shower, WC, hairdryer, cosmetic mirror, 40'' LED flat screen TV, refrigerator, desk, phone, insect screen. Internet access is available via WIFI and cable. 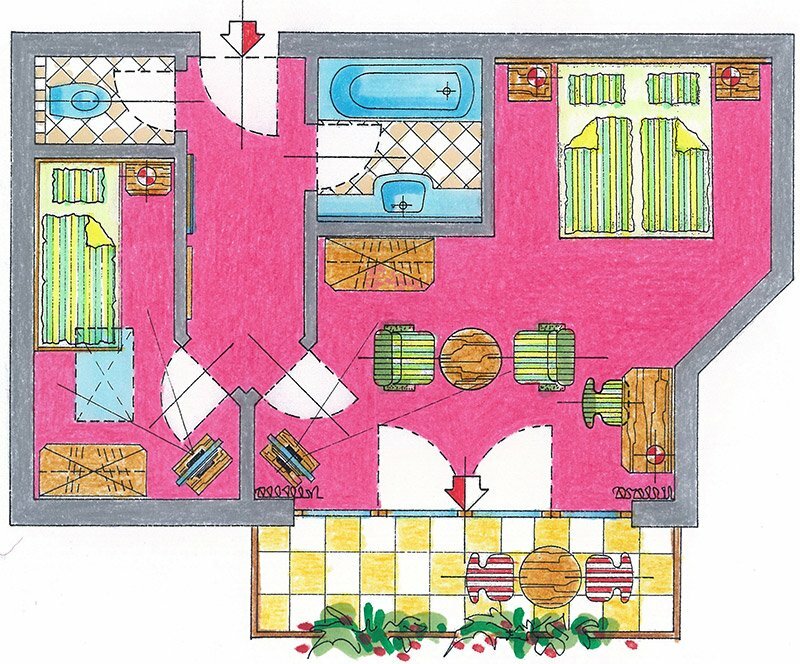 The ideal occupancy is two persons. There are additional couches for a maximum of two children. 22 m², new renovated double room in the adjoining building with shower, WC, phone, safe, cosmetic mirror, 40'' LED TV, hairdryer, refrigerator, Internet access via WIFI and cable, balcony, for two persons, additional bed possible in some rooms. 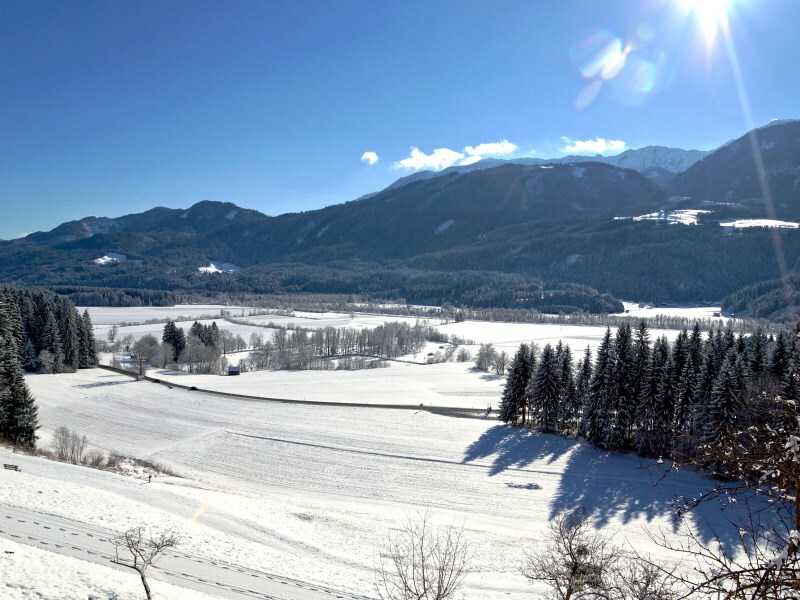 NEW for Winter 2019: Double room Komfort in adjoining building were renovated completely. 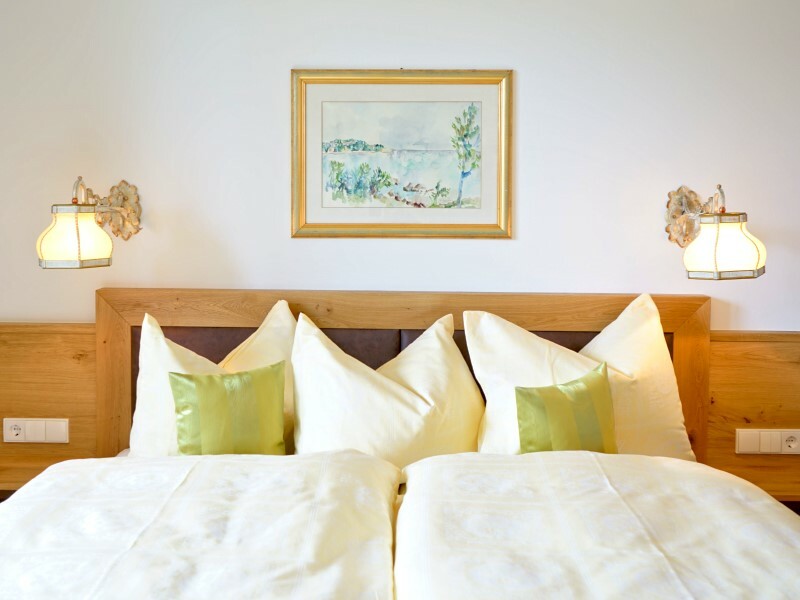 All Double Komfort rooms were renovated completely in Autumn 2018. They have a balcony with view to the garden, dimmable lamps, black-out curtains, shower, WC, hairdryer, cosmetic mirror, 40'' LED flat screen TV, refrigerator, desk, phone, insect screen. Internet access is available via WIFI and cable. The ideal occupancy is two persons. In some rooms there is an additional couch for a child..
New from Winter 2019: Panoramasuite “Drautalblick” type C in the adjoining building was renovated completely. 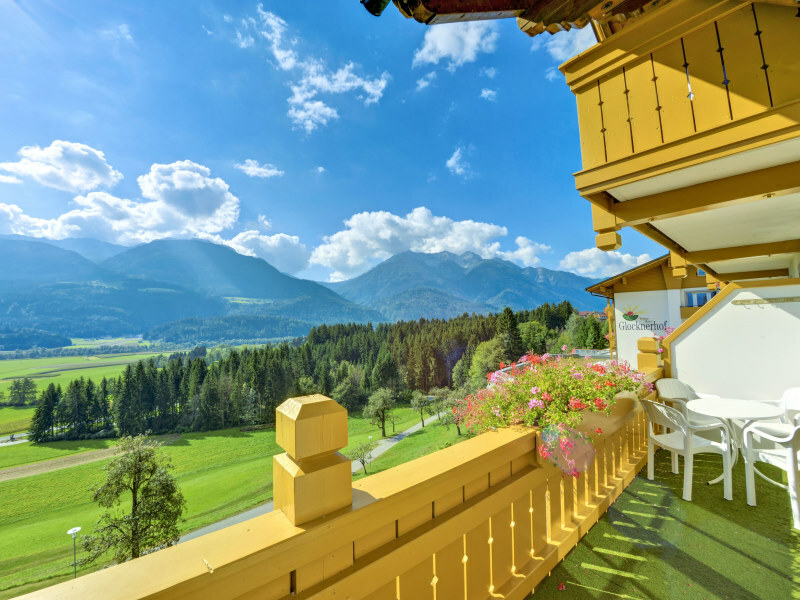 The Suite Drautalblick in the adjoining building was renovated completely in Autumn 2018. 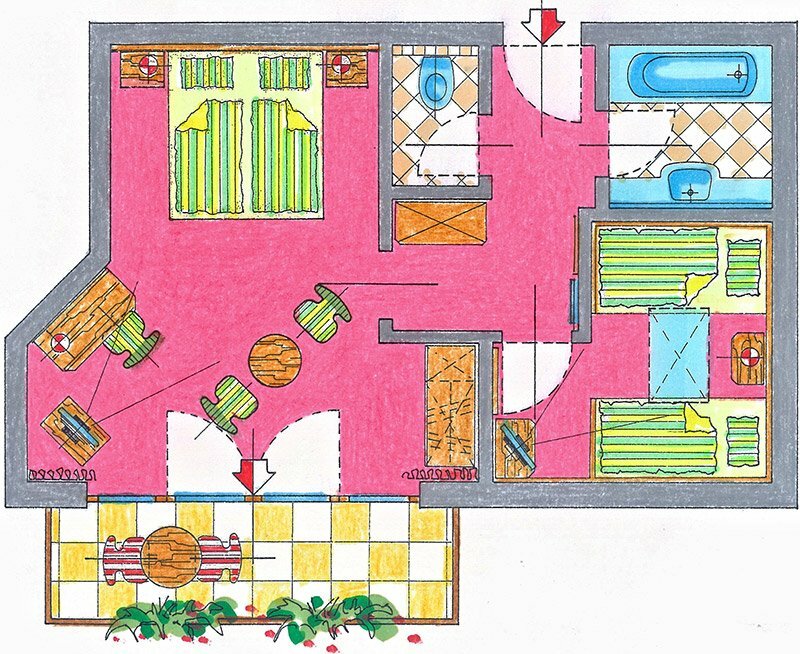 It has two bedrooms (one larger bedroom with a living area and a smaller one with two single beds). 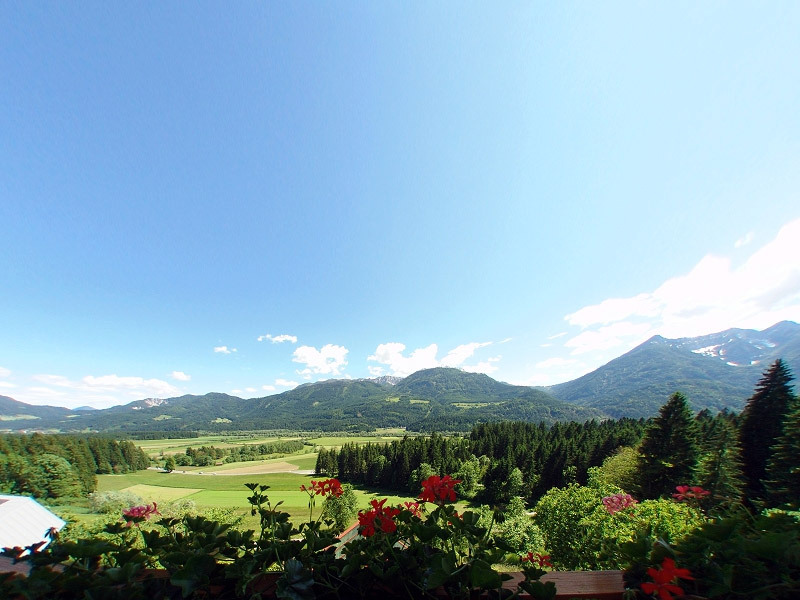 From the balcony you have a fabulous 270° panoramic view of the surrounding mountain landscape. The room also has a bathroom with shower, hairdryer and cosmetic mirror, a separate WC, dimmable lights, black-out curtains, two 40'' LED flat screen TVs (one TV in each bedroom), desk, refrigerator, safe, insect screen and phone. Internet access is available via WIFI and cable. 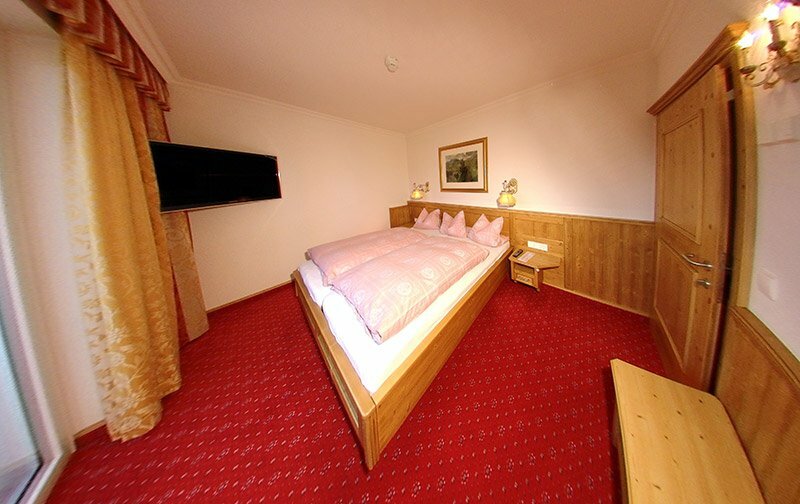 In total there are 4 normal beds in the room. There is also space for larger families thanks to the pull-out couch. 130 m² solid wooden house for 4 - 8 people, two bedrooms, safe, galleried living room with fireplace, kitchen, whirlpool, shower, three WCs, three LED TVs, south-east facing terrace, south-east facing balcony, WIFI, right by the tennis court and the edge of the woods, approximately 200 m from the hotel. 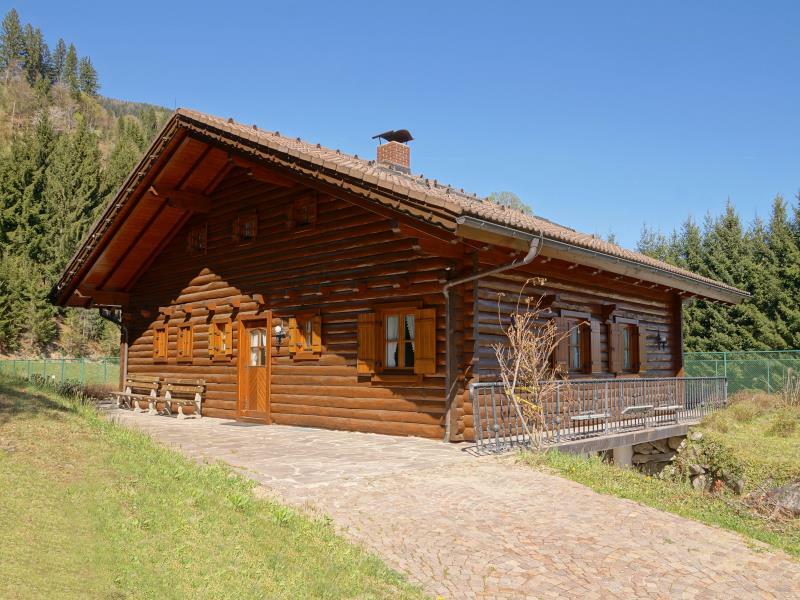 This solid wooden house offers a great deal of space for four to eight people. 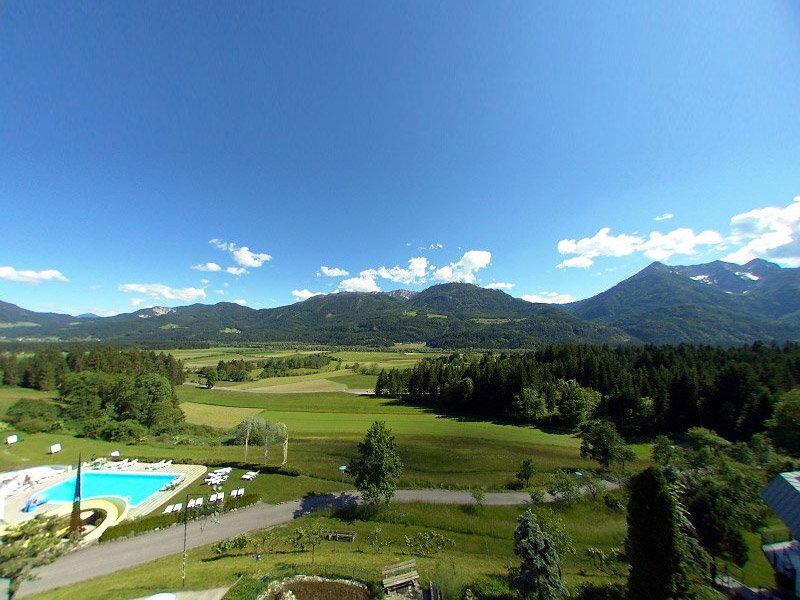 It is in a very peaceful location at the edge of the woods near the tennis courts and approximately 200 m from the Hotel. You can drive right up to the door of the house for convenience. 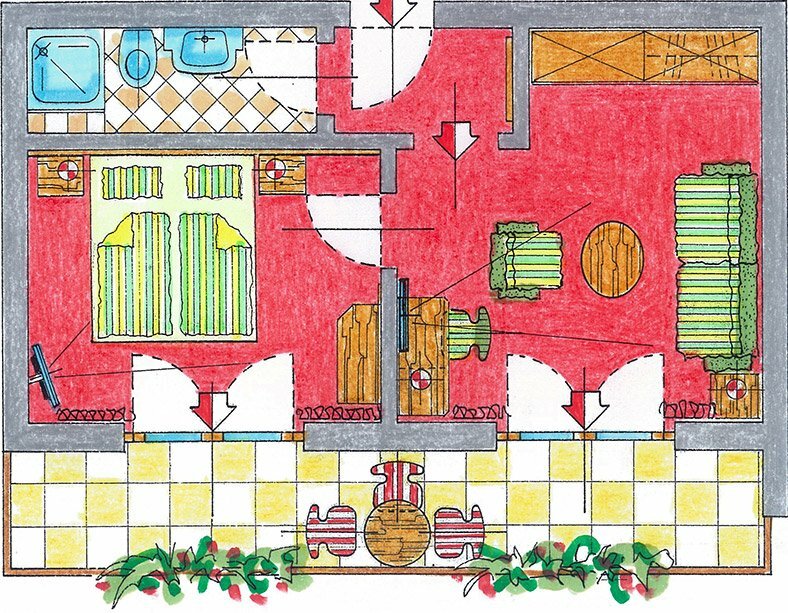 Ground floor: Living room / bedroom with fireplace and 46'' LED TV, kitchen, television area, south-east facing terrace, wardrobe, toilet, and storeroom. 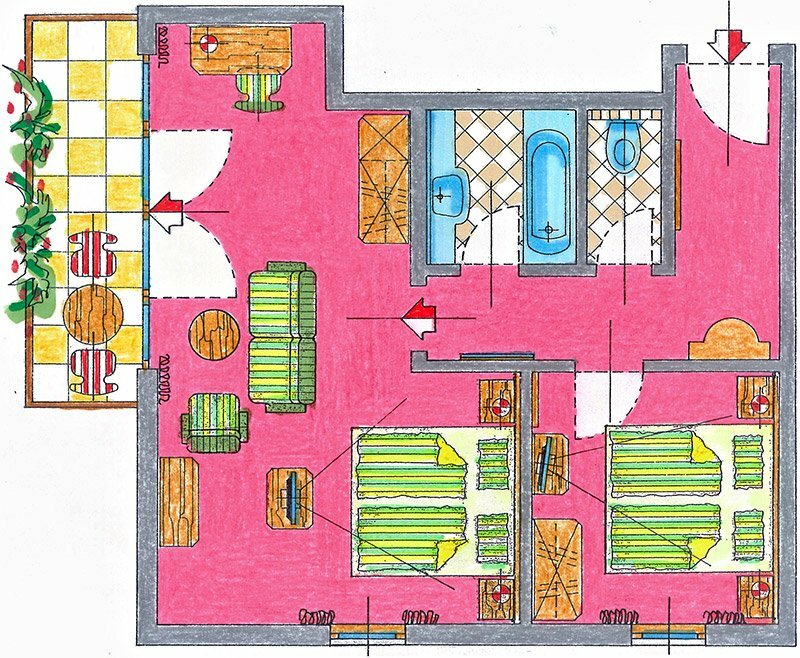 1st floor: 2 bedrooms with safe, 40'' LED TV and south-east facing balcony, sleeping gallery, shower and WC, bathroom with jacuzzi bath, separate WC. WIFI Internet access is available. For the first two or four people we charge the basic price per person according to the price list. Every further person is charged according to the children’s price list for the double room A “Deluxe”. 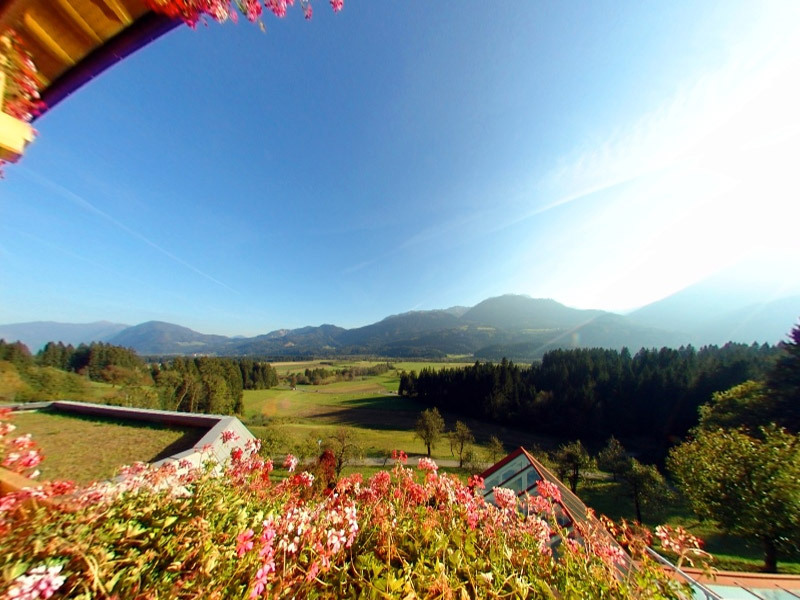 Our tip: Book the Biohaus 2 at the same time and have the entire wooden house to yourself! 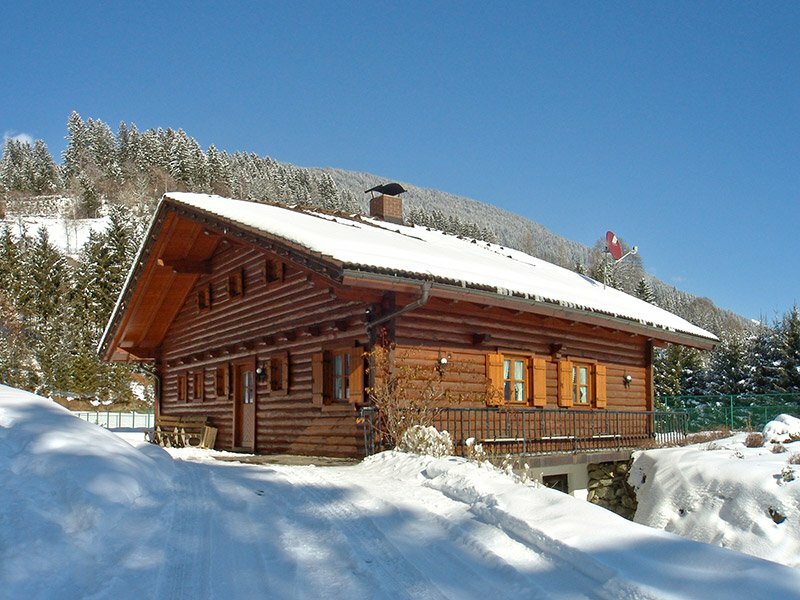 30 m² double room in the solid wooden house for 2 people, separate jacuzzi bath and WC, 40'' LED TV, east-facing terrace, small kitchenette, WIFI, right by the tennis court and the edge of the woods, approximately 200 m from the Hotel. 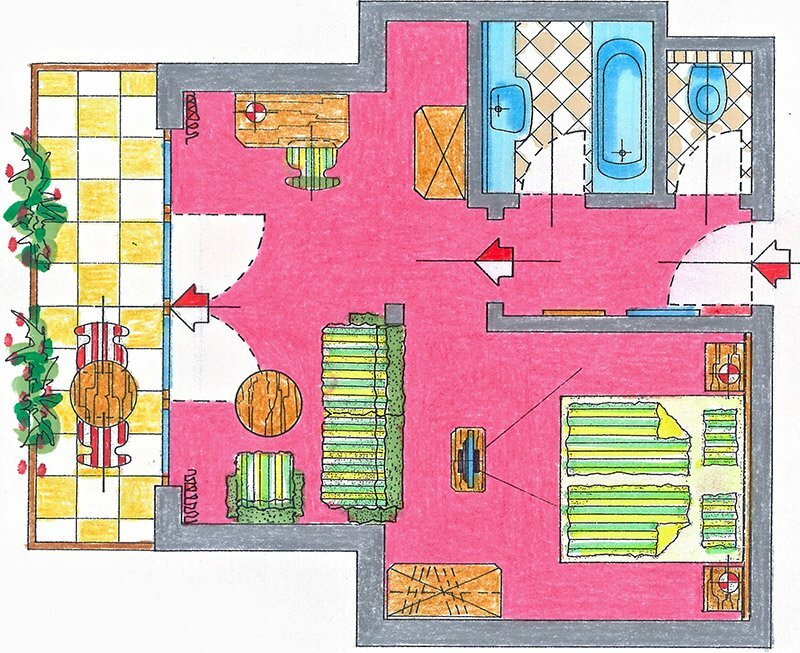 Furnishings: bathroom with jacuzzi bath, separate WC, TV, east-facing terrace, kitchenette, 40'' LED TV. WIFI Internet access is available. 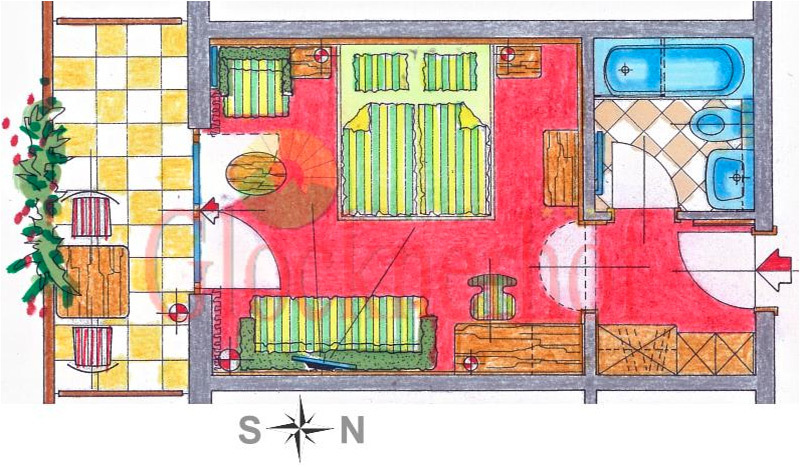 Biohaus 2 is ideal for 2 people seeking peace and quiet, or can be booked as an add-on to the Biohaus 1. 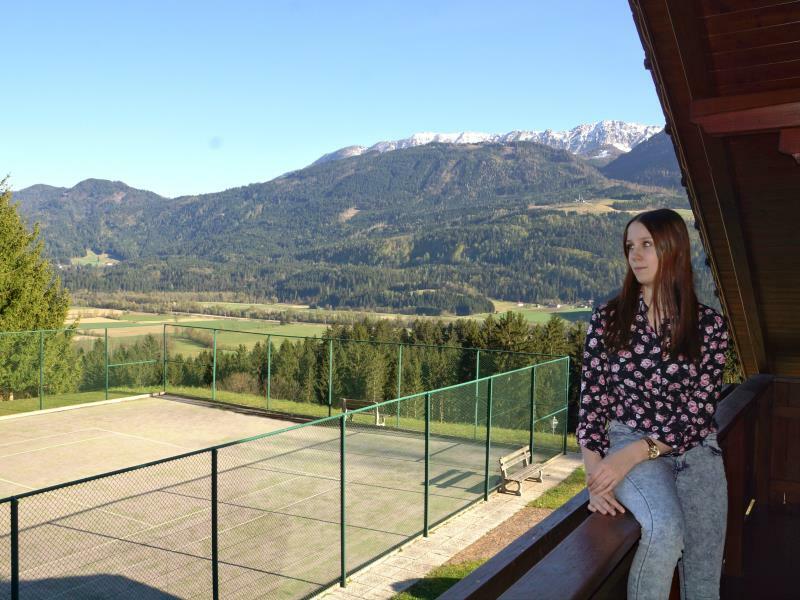 The Biohaus is in a very peaceful location on the edge of the woods right by the tennis court and approximately 200 m from the Hotel. You can park directly in front of the house.